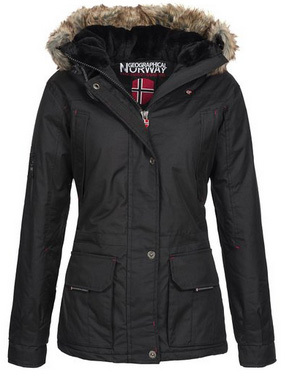 This winter a must have item that you should not miss in your wardrobe, is the parka jacket. 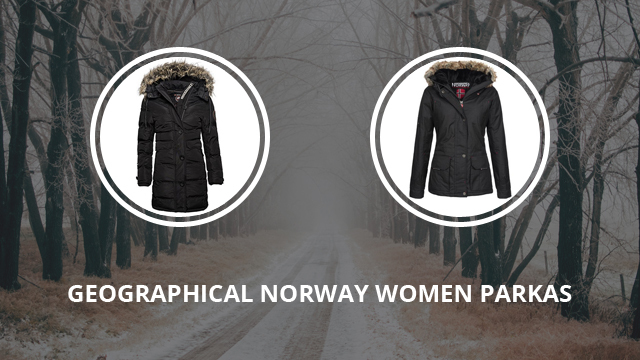 So, to make your selection easy, in this article we have carefully picked 9 wonderful women parkas branded Geographical Norway. 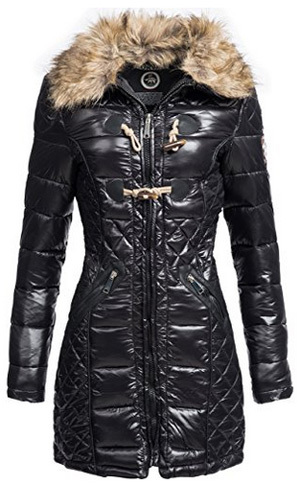 With these beautiful coats you will be fashionable and sure to have a warm winter. Let’s begin! 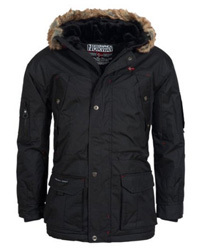 Atlas is a 100% Polyester winter parka jacket, in a long cut, which covers the back when bending forward. It comes with removable faux fur trim on the hood and inner cuffs made of ribbed elastic material. There are many pockets, which include: two side pockets, two chest pockets, one on the arm and three inner pockets. To properly adjust the jacket, there are bungee cords around the waist and hem, as well as on the hood, to fully protect the face. The zipper is weatherproof and comes with a snap button cover that protects against wind and rain. There are two small logos on the outside and one large on the inside of the jacket. This jacket comes in two colors: Black and White. The Alaska winter jacket is designed to withstand freezing temperatures while remaining warm, dry and comfortable. 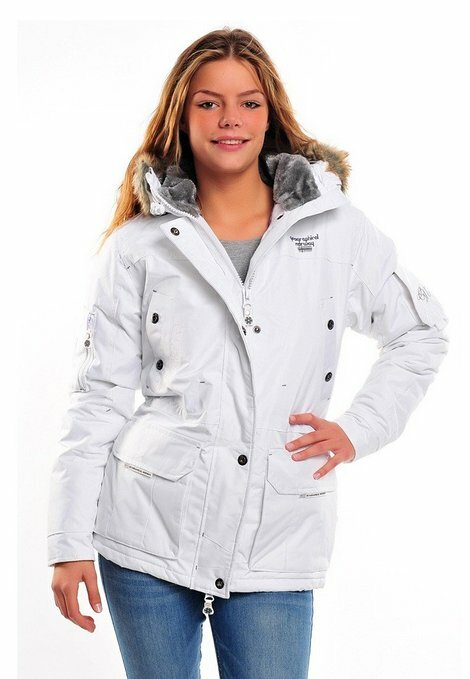 It is a 100% Polyester parka, with heavy padding to offer warmth and insulation. 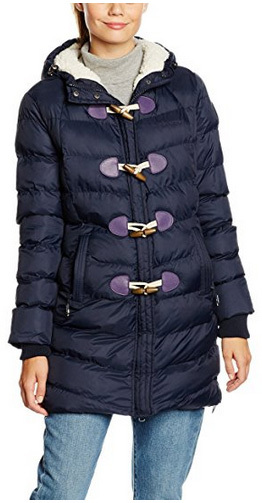 The front zipper is waterproof and is covered with a snap button placket, and it goes all the way up to the long collar, which fully covers the neck. 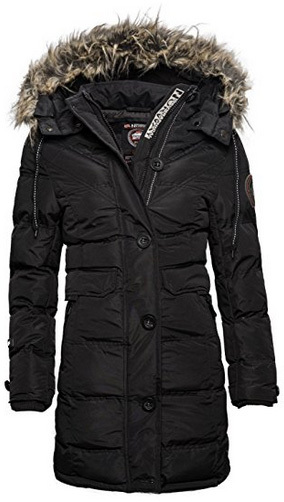 It comes with a removable hood, lined with a thick and wide faux fur trim that can be zipped around the collar when the hood is not attached, and further protect the neck from low temperatures. There are two side pockets, two chest pockets, one pocket on each arm and several inner pockets, as well. It comes in two different colors: White and Black. 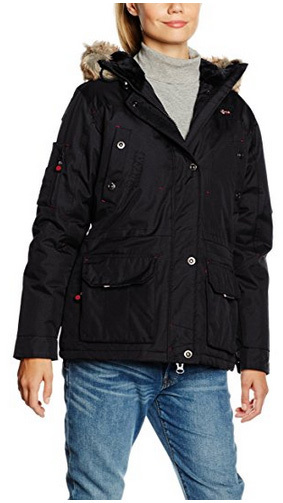 This next parka, called Alpaga, is a long and slim cut jacket, made of 100% Nylon for the outer shell and 100% Polyester padding and inner lining. 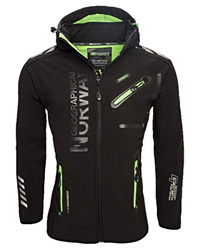 It is a weather-resistant jacket, suitable for harsh winters and comfortable, as well as form-fitting. It has a removable hood, lined with thick artificial fur trimming, and a high collar. The main zipper is covered with a Velcro fastened placket. There are four oversized pockets on the outside and two inner pockets. The cuffs are made of elastic, ribbed material and are longer, to protect the hands properly. The jacket is easy to move in and it can be worn during outdoor activities such as hiking, camping or even light exercising. There is one color option: Black. The Achem jacket is perfect for those who prefer a warm but not stuffy jacket. It is a loose cut and comfortable to wear for hours. It is made of 100% Polyester, with an inner fleece lining that is highly breathable, insulated and warm. There are a lot of pockets, placed on the sides, chest, arm and three on the inside. 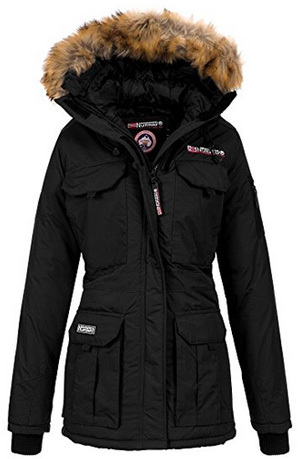 It comes with a detachable hood, lined with artificial fur trim, that is also removable. The main zipper has a snap button cover and there are drawstrings on the hem, waist and hood. It comes in two colors: Black and Navy, both with small details in Red. 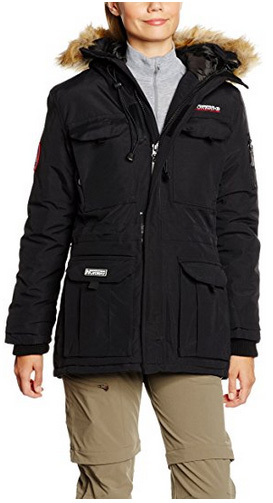 The Alcatraz parka for women is a compact and lightweight jacket, designed for cold winters and snowy weather. It comes with ribbed inner cuffs and an attached hood, lined with faux fur trim. There are two side pockets, two chest pockets and two inner pockets, all of them oversized, with plenty of room to carry your essentials. It is adjustable with drawstrings, placed on the hem, waist and hood, while the main zipper comes with a waterproof placket, Velcro fastened. 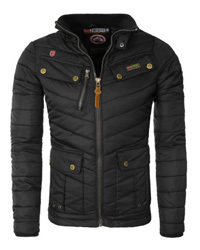 It is a stylish and comfortable jacket, that can be worn daily or as the go-to jacket for outdoor activities. There are three colors available: Navy, White and Black. 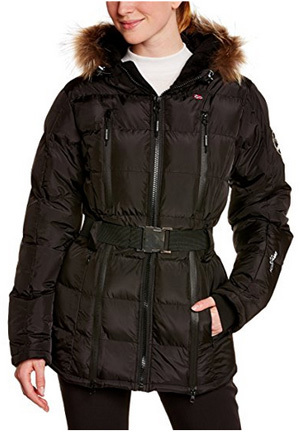 Beverly is a long parka, that comes in a horizontal quilted design. There are two zipper pockets on the sides and one zipper pocket on the inside. The material is 100% Polyester both inside and out, with a teddy fur padding that provides plenty of warmth. This jacket is designed for harsh winters and high functionality, so moving around with it on is not a nuisance. It closes up with a hidden zipper and can be buttoned with wooden buttons. The inner cuffs are made of ribbed material and the hood is attached and lined with teddy fur, as well. There are three colors available: Navy, Black and Burgundy red. Long mantel jackets are not only comfortable but also fashionable and trendy. This one is the Colasina parka, lined with faux fur and with a wide quilted design. It zips all the way up to the long collar and has a button closure placket that covers the zipper. The side pockets are oversized and with dual openings, and there is also an inner pocket. It comes with buttons on the outer cuffs, for detail, and the inner cuffs are made of elastic ribbed material, very soft and warm. 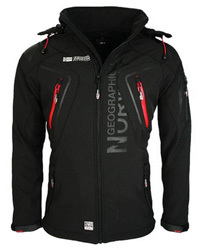 This jacket can withstand low temperatures without issues and fares well in wet and windy conditions, too. The color options are: Navy, Black and Red. Belladona is a mantel parka that “turns heads on the street”. It is not just a warm and comfortable jacket, it looks good, too. It is made of 100% Nylon for the outside and 100% Polyester for the filling and inside, with the outer shell shiny and stylish. The quilting is a mix of horizontal, square and diamond quilting, which add to the beauty of this jacket. There are two side pockets and one inner pocket and there are also two wooden buttons on the chest. It comes with faux fur trim around the collar and artificial leather applications. The color option is the black. Archipel is a 100% Polyester jacket, with a detachable hood and faux fur trim around it. This jacket is a loose cut, that fastens around the waist with a belt, turning it into a real form-flattering parka to wear. It is quilted, which distributes the polyester padding appropriately, to provide warmth and insulation. There are two side pockets and two chest pockets, with inner pockets on the inside as well. It comes with two side zippers, parallel to the main zipper, which add to the look of this jacket. The inner cuffs are made of ribbed soft material, which keeps the hands warm and insulates the parka. It comes in three colors: Black, White and Violet.